I am anxiously waiting for the release of Wes Anderson's next flick The Darjeeling Limited. To wet our appetites, Anderson has released a short that acts as a prequel to the movie. 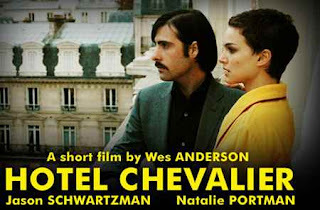 Hotel Chevalier is a 12-minute “prequel” to The Darjeeling Limited, starring Natalie Portman and Jason Schwartzman. It takes place in Paris two-weeks before The Darjeeling Limited. I believe it was originally part of the movie but trimmed out in the editing room to keep the movie an average length. The film is available for free download from iTunes. You’ll have to have iTunes installed and a registered iTunes account in order to get the free download. Click here to go automatically to the Hotel Chevalier download page. It should launch iTunes if you have it installed. Or you can just search for it in the iTunes store.